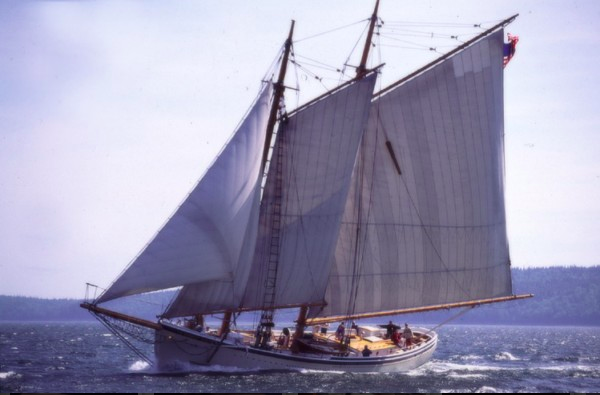 Penobscot Bay Voyage - June 5 to 9, 2018 on board Schooner American Eagle, Rockland, Maine. Join teens from schools all over Maine in a spring voyage of discovery on board Maine's premier historic sail training ship with Captain John Foss, one of Maine's legendary tall ship captains. While learning navigation, meteorology and sail handling, a 5-day sailing voyage equates to one semester of academic credit. “This is a great way for these teens to learn outside the classroom,” said Jon Radtke, Assistant Principal at Falmouth High School. “Experiential learning has a profound effect on a student because they learn a lot about themselves. The other great aspect of life at sea is that whatever ‘group’ you belonged to in school is left at the pier. Tall ship living is the great equalizer.” While on board American Eagle, students will augment the crew and do the same challenging, team-based operations around the clock to keep the boat sailing on wind power. They will have the experience and the responsibility of standing a watch and keeping watch over their shipmates. Students will have their own berths below decks and will enjoy hot meals from the ship's traditional galley. Watch this video of a recent Tall Ships Portland sail training voyage to hear the perspective of other students during their first sail training experience. Cost for the 4 night accredited voyage is $950 including all expenses. (Price does not include transportation to and from Rockland where the voyage starts and ends.) Financial aid is available for those with demonstrated need. School groups welcome. For more information, contact info@tallshipsportland.org or call 207-619-1842.